The LUXqed approach provides a model-independent determination of the photon parton distribution function (PDF) inside the proton. It is based on structure function and elastic form factor fits in electron-positron scattering, as described in arXiv:1607.04266 and arXiv:1708.01256 (and associated Zenodo record). 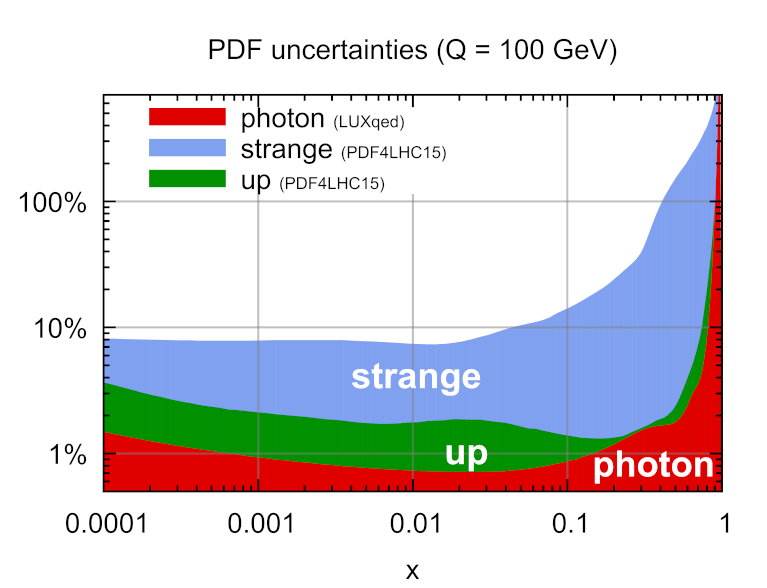 LUXqed17_plus_PDF4LHC15_nnlo_100, the preferred form of the PDF discussed in arXiv:1708.01256. It combines QCD partons from PDF4LHC15_nnlo_100 with the LUXqed17 photon determination. LUXqed17_plus_PDF4LHC15_nnlo_30, a more compact form based on the PDF4LHC15_nnlo_30 set. LUXqed_plus_PDF4LHC15_nnlo_100, corresponding to the results shown in arXiv:1607.04266. These PDFs should only be used at scales μ>10 GeV. The low Q2 LUXqed photon component is determined from A1, CLAS and Hermes GD11-P fits. The high-Q2 part is determined from the input QCD PDF with standard (massless) NNLO coefficient functions. The photon was generated at scale 100 GeV, and other partons matched at scale 10 GeV. Momentum conservation is enforced by scaling the gluon distribution at scale 10 GeV. The DGLAP evolution includes the O(α αs) splitting functions from arXiv:1512.00612.
momentum fraction carried by the photon as a function of the factorisation scale (the various pages just show different vertical scales, with and without other photon determinations). validation plots, including a visualisation of the photon distribution and the impact of QED corrections on the various partons.